We staple a wide variety of project both off-line and in-line. 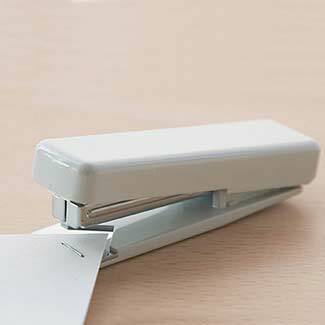 The most common forms of stapling are upper left in landscape or portrait formats. Will also provide a book staple in-line, which is 2 staples down the left side of an 8.5 x 11 portrait sheet. In-line stapling is popular because we can collate front and back covers as well as tabs and inserts automatically before stapling together. All of these pieces can be printed on different paper stocks providing lots of creative ways to produce your document. All of our in-line stapling options are a fast and inexpensive way to securing fasten documents together.